1. Preheat the oven to 220ºC, gas mark 7. Stir together the flour and baking powder, then using your fingertips, rub in the butter until it resembles breadcrumbs. Using a table knife, stir in three quarters of the Cheddar and then the milk to make a fairly soft dough. brush lightly with milk and scatter over the reserved cheese. Bake for 10–12 minutes until risen and golden brown. Transfer to a wire rack and leave to cool. 3. 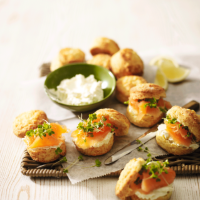 Split each scone in half, spread the base with soft cheese, top with a piece of smoked salmon and sprinkle over some cress before replacing the top. Serve with small wedges of lemon for squeezing over the salmon. Add texture to these scones with the inclusion of pumpkin seeds. Mix a handful in with the ingredients at the end of step 1.